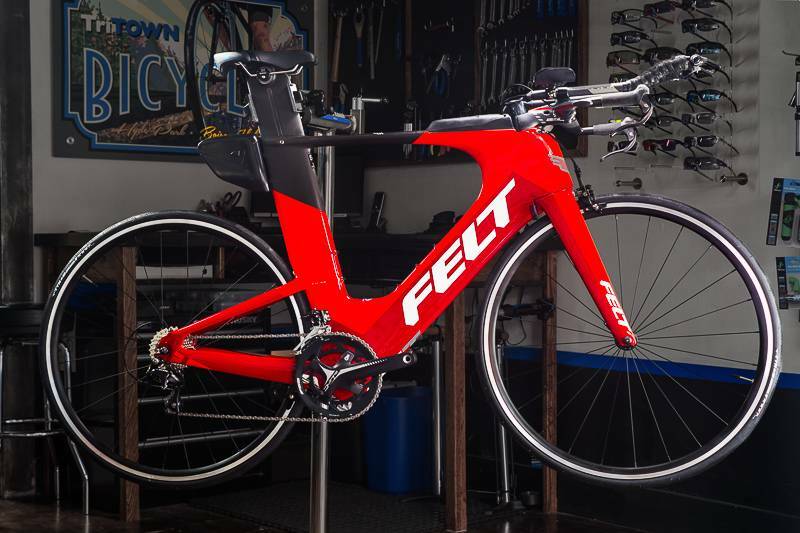 Summary: The Felt IA immediately became a category leading triathlon bike when it was released in 2014. 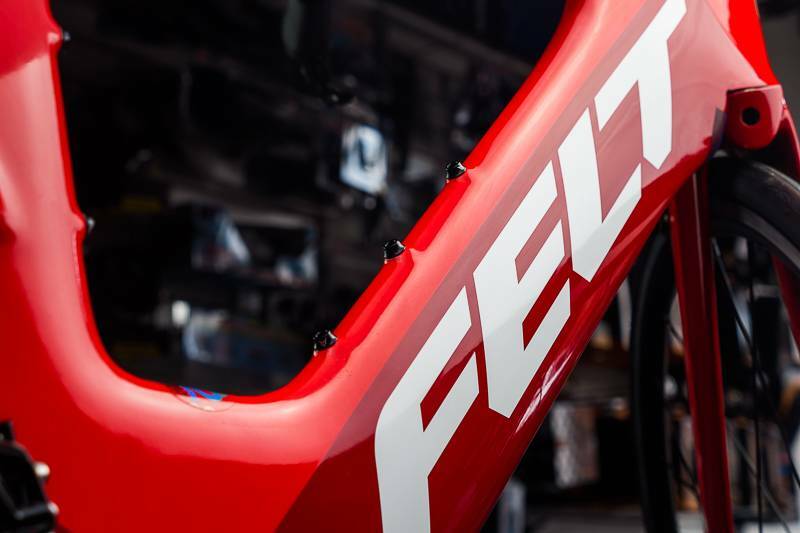 The 2018 version of the Felt IA16 is a race ready bike that has improved upon it's predecessor in subtle but significant ways. 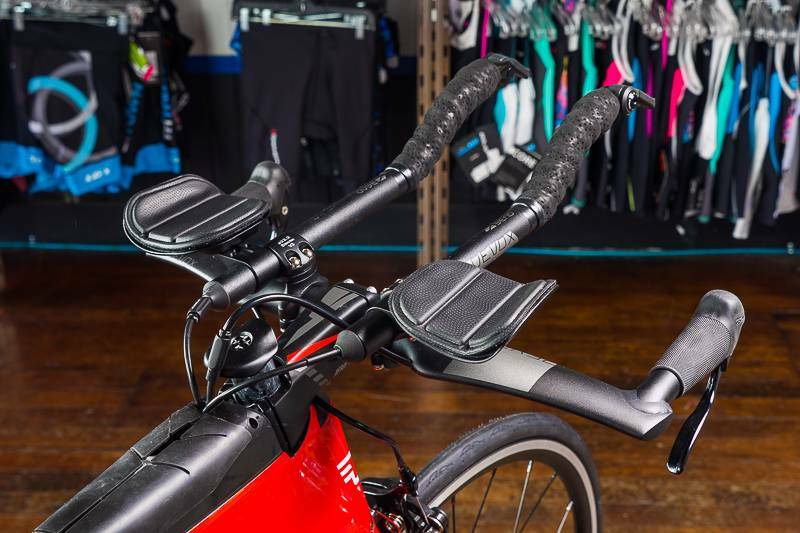 A more versatile platform than the IA 1 or 2, the IA16 is an ideal triathlon bike for almost any intermediate to beginner triathlete, or even an elite triathlete who does not want a fully integrated triathlon bike. The Fit: The IA 16 is highly adjustable, even more so than the IA 1 or 2. Unlike the IA 1 and 2, the fork steerer tube on the new IA 10 and IA 16 comes uncut, meaning you can use a traditional stem and/or space the stock stem up to 4cm. This provides more "fitting freedom" than prior versions. 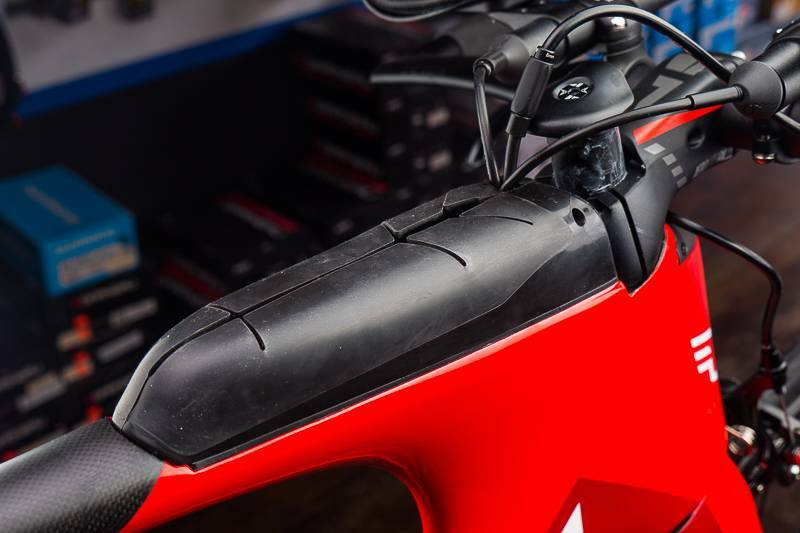 Additionally, the aerobars come with a variety of spacers to pedestal both the armrest and extensions up to another 9cm above the basebar. 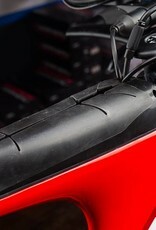 The bike's seat tube angle varies from 79.5 degrees in the 48cm size to 77.5 degrees in the 58cm. This is relatively steep, which is exactly what we'd expect from a triathlon specific platform like the IA. In general, we have found the IA to fit a bit short in length, occasionally requiring an athlete to size up in frame sizes. This is less an issue now that you can run any stem you want. We recommend starting any IA discussions with a sizing fit, something we do for free if you're considering a bike. 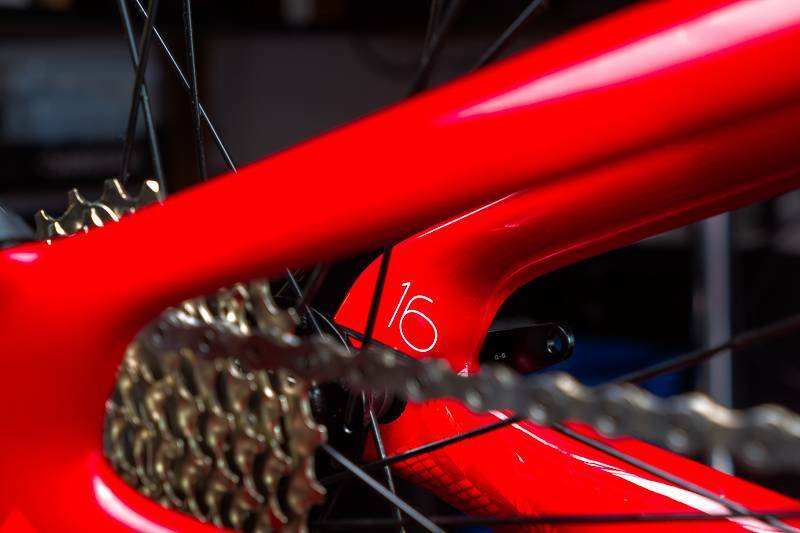 The Frameset: The 2018 IA16 has a brilliant red color scheme that is very eye catching. We hope our pictures do it justice- it looks amazing in person! Aerodynamics and integration is the theme throughout the IA. The deep carbon fiber fork, frame tubes, and seatpost are defining features. Felt spent their time in the wind tunnel refining the shape of this bike, and it shows. Not concerned with creating a UCI legal bike, Felt designed the IA to be one the fastest triathlon specific bikes ever made. The result is a frameset that flies at speed. Smaller riders may feel pushed around on this bike on windy days. But this has not stopped riders like Mirinda Carfrae from winning Kona (one of the windiest races in the world) multiple times on the top end version of the frameset. 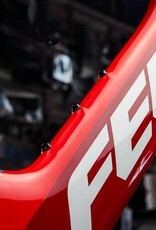 The seatpost is an ingenious system using an internal wedge to compress the post against the sides of the frame. We have never had an IA seatpost slip or fail on us. 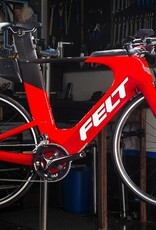 Felt partnered with 3T and uses their 'Diffloc' saddle clamp system to hold the saddle in place. The Diffloc system takes patience when dialing in your saddle tilt, but once setup will never slip. 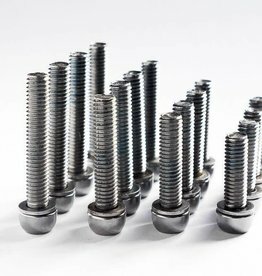 Shop Tip: when bolting down your saddle be sure to evenly tighten the left and right Diffloc bolts. Also, do not over-tighten, we've seen them strip out on occasion. Felt accomplishes further integration through a variety of proprietary features. The rear brake cable and both derailleur cables route internally through the frame, entering behind the stem. A traditional dual pull front brake, and a direct mount TRP rear brake handle stopping duties. Integration continues with the bento box installed behind the stem. Felt calls their proprietary bento box the Calpac 2.0. The Calpac mounts directly to the frame and provides easy access to your nutrition. The new Calpac 2.0 is a significant improvement over the older model- it is easier to get food items in and out, and cannot accidentally open or come off. Another benefit of this integrated bento box comes when having to re-cable the bike (or run Shimano Di2 cables if configured that way). 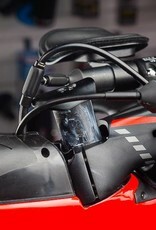 By removing the Calpac your mechanic is left with a large opening in the top tube to fish cables through. Sounds silly- but any mechanic will be grateful for the ease of cable routing and installation. New for 2018 is the BTSpac storage box. BTS stands for "Behind the Saddle", and that's pretty much exactly where you find it. 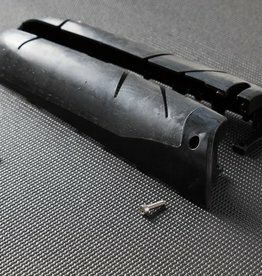 The BTSpac can hold all the repair items you'll need to fix a flat on the road. The system works well, mounts easily, and does not open on its own. Older versions of the IA 10, 14, or 16 have mount holes for a system like the BTSpac. 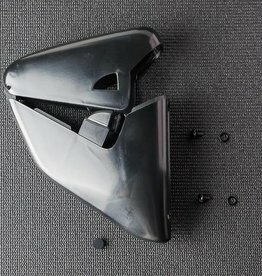 IA's 1, 2, and 3 prior to 2018 do not have the mounts for the BTSpac. Finally, the seat tube and down tube have mounts for water bottle cages. We love this- and wish all triathlon bikes afforded the rider the opportunity to hold two bottles on the frame. 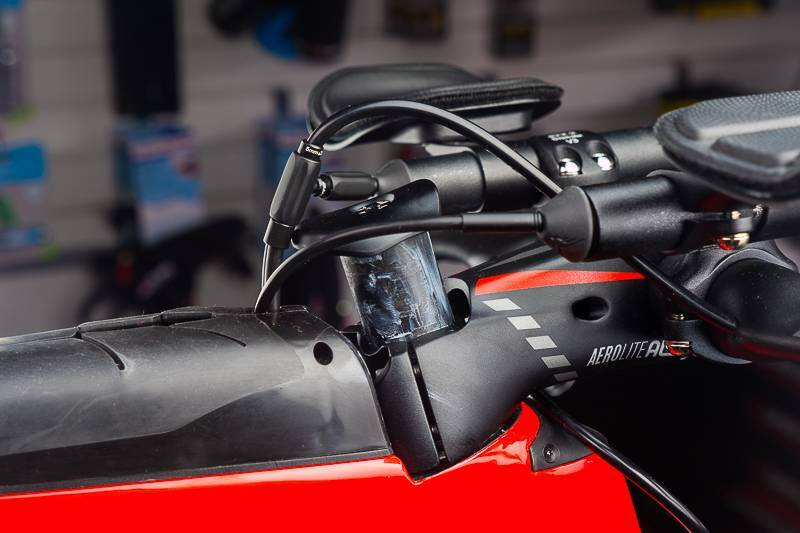 Who cares how aerodynamic your triathlon bike is if you're dehydrated and bonking 70 miles into an Ironman? 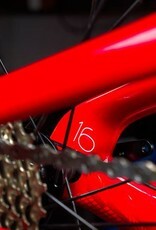 The Components: The IA 16 uses a mixed component package that is practical and functional, but not flashy. 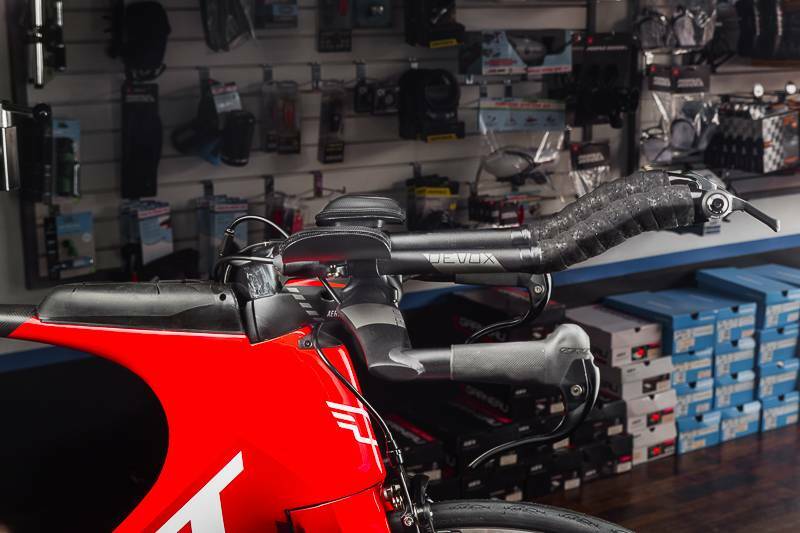 By 'mixed component' package we mean that the parts come from a variety of manufacturers- the aerobars, basebar, stem, and wheels come from Felt's Devox line. Derailleurs, cassette, and chain from Shimano. Compact crank from FSA. 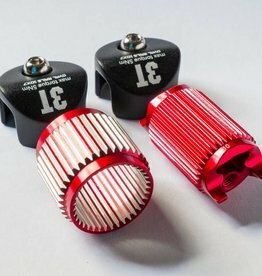 Shifters from Microshift. Brakes from TRP. Saddle from ISM. 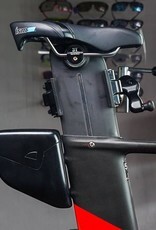 The highlight of the component package is the cockpit- Felt's Devox basebar, aerobar, and stem combination is arguably the best OEM aerobar system on the market. 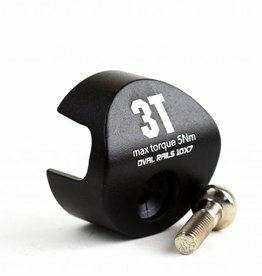 Especially now that you can add a traditional stem (as opposed to being forced to using the IA-specific stem), there is little more a bike fitter can ask for when helping you find your ideal position. 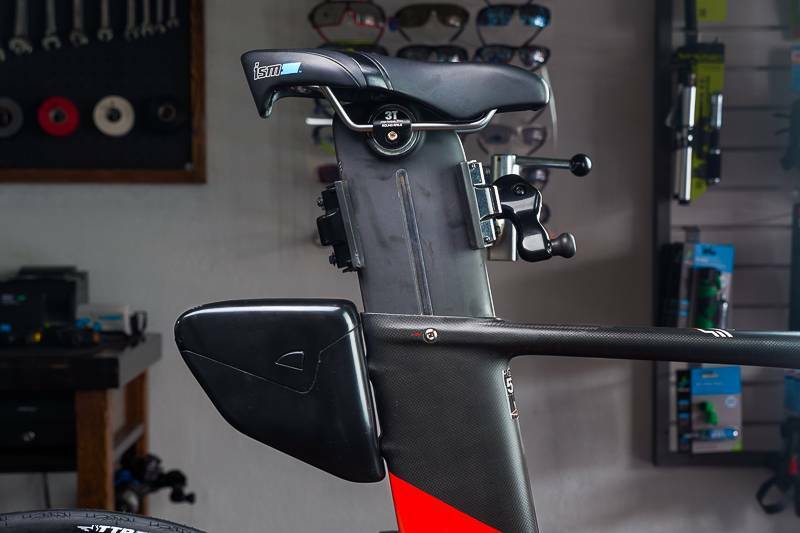 We feel adjustability is the most important feature in a triathlon setup, and the Devox cockpit delivers. When it comes to aerodynamics, the base bar has an aero profile, and the brake cables can be routed cleanly through the stem if you desire. The Shimano derailleurs work brilliantly. 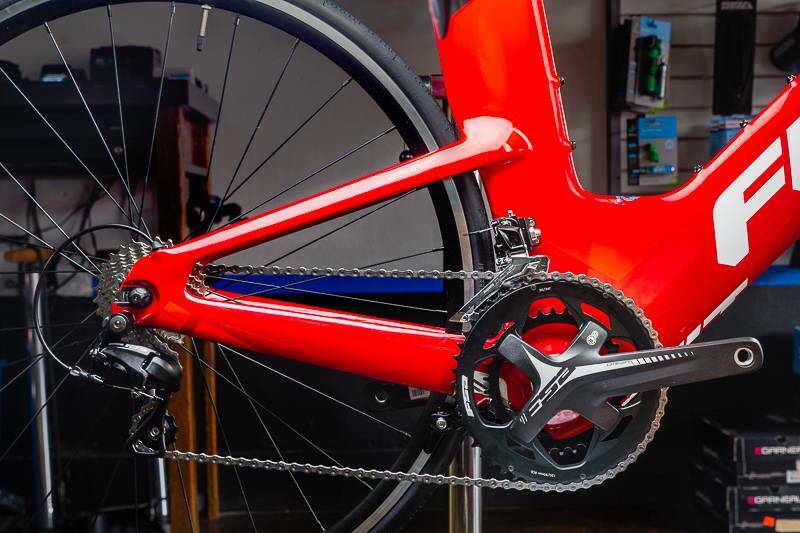 The 2018 IA 16 comes with the updated Shimano 105 front derailleur. 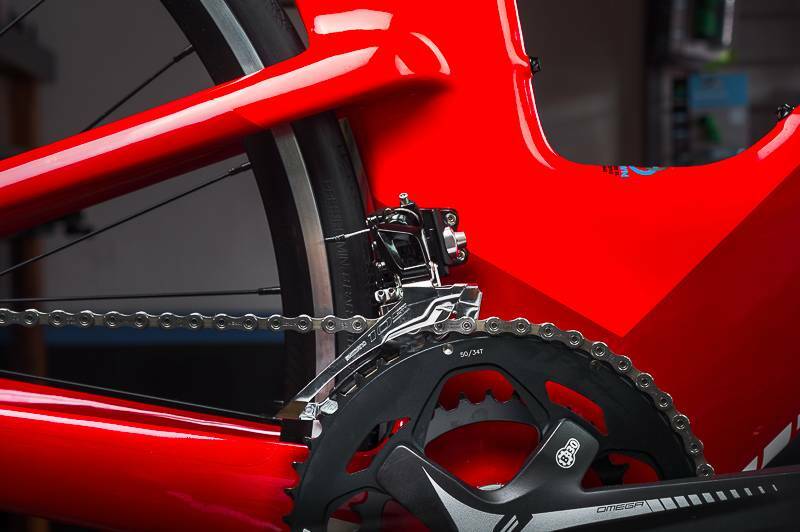 The new front derailleur has a host of new features that are mostly relevant to the road cyclist, but triathletes using classic TT friction shifters will still appreciate the clean design and built in barrel adjuster. The Devox wheelset are tubeless ready, and come with the highly underrated Felt Aero TTR2 tires (tires not tubeless ready). Overall we have had no issues with the Devox wheels over the years, and find them to be a great training or entry level race wheelset. Felt spec'd an ISM PS 1.1 saddle- another great choice that will work for many triathletes. 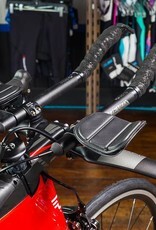 The saddle's long rails give the rider a wide range of fore-aft adjustability. 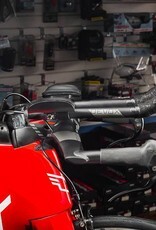 This is an important feature on a bike like the IA which does not have a built-in feature to change the seat tube angle. 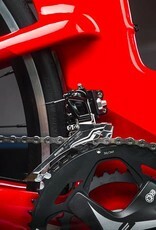 The TRP rear brake isn't horrible, but it is harder to install and adjust than the Shimano version. We'd like to see Felt spec the Shimano direct mount rear brake in future models, even if it requires a slight price adjustment. Felt: your clients and retail partners will thank you. Schedule a Complementary Sizing Fit to help determine your ideal size. 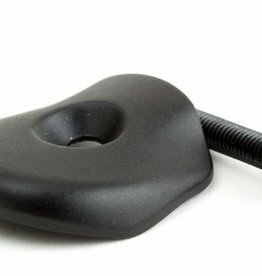 The 3T Difflock saddle clamp mechanism fits multiple bicycle seat posts including the Felt IA. 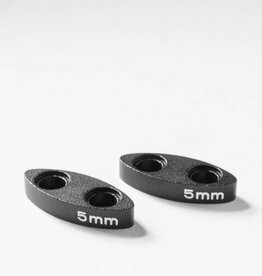 3T Difflock saddle end caps used for the Felt IA seatpost. Round or oval rails available. This is a replacement Felt IA and AR seatpost bolt for Felt's aerodynamic seatpost. 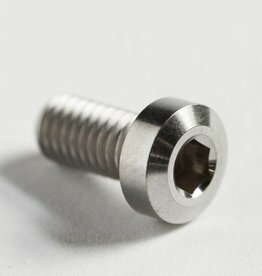 Stem Cap and Bolt for stock Felt IA 16 & 10 models. The 2018 Cervelo P2 is one of the best and most versatile triathlon bikes ever made. 2018 brings two new paint schemes and a parts update.